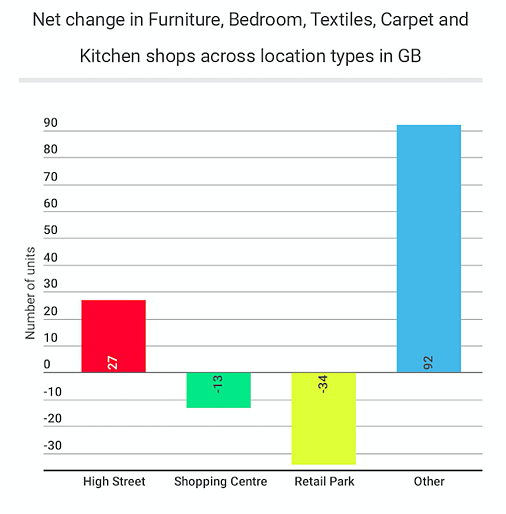 LDC have researched the historical trends in the British bulky goods sector (stores which sell home furniture, baths, kitchens, beds, tiles and carpets), focusing on the growth or decline of the traditional retail park occupiers. This analysis looked at the five year trends (2012 to 2017) across the Furniture, Kitchens, Carpets and Textiles sectors. These categories are all facing intense pressure from growing online sales so we decided to look closer at their performance. Nationally, there has been a 6.3% drop in the number of bulky goods units from 2012 to 2017, which is a net decline of 1,227 stores. All regions apart from Wales have seen a decline in the number of bulky goods stores. The North of England saw the biggest drop in stores, with the North West leading the way with a large drop of 9.1%. The East Midlands (-2.2%), Yorkshire and the Humber (-3.4%) and Greater London (-5.5%) experienced a lower rate of churn in retailers than the GB average of 6.3%. 72% of the bulky goods sector is currently represented by independent retailers (brands with less than five units nationally). Examples include Simple Furniture in Barking or Floor Décor in Ilkley. 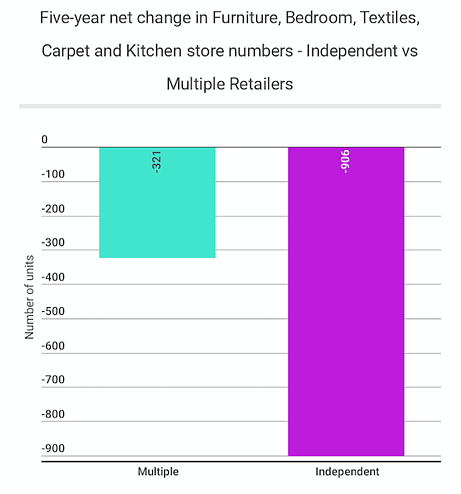 However, this percentage would be much smaller if floor space was used as a measure, due to the large store size of the multiple retailers such as DFS and Carpetright. 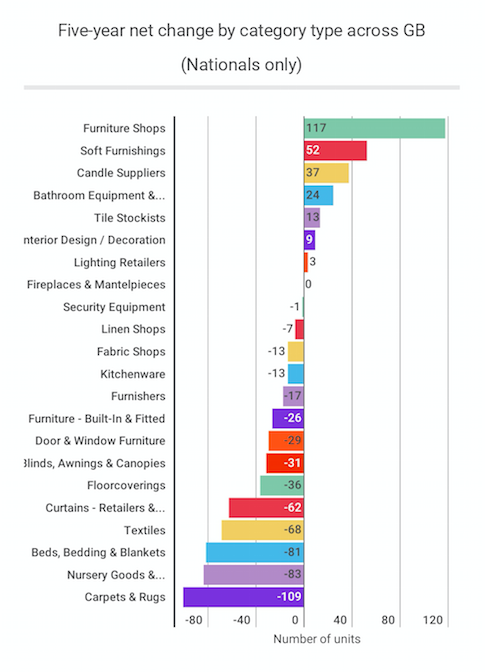 Independent bulky goods stores have seen the largest decline in the last five years with a net loss of 906 stores across GB (-6.5%). Multiple chains have also seen a drop in numbers, with a net loss of 321 stores (-6.0%). A number of large multiple retailers have gone into administration (e.g. Betta Living and Floors-2-Go), which has resulted in the closure of stores nationwide. Consolidation in the market with the growth of online sales has also increased the decline in store numbers. Several national multiples have expanded their stores, with a few opening new, smaller store formats acting as showrooms to support online trade and increase awareness of the brand. Examples of retailers opening smaller stores include Dreams. Analysis of the multiple retailers reveals Furniture stores as having a net increase in stores with 117 new units (+11.6%) over the past five years. Carpet stores saw the largest net decline with a loss of 109 stores (-16.2%). 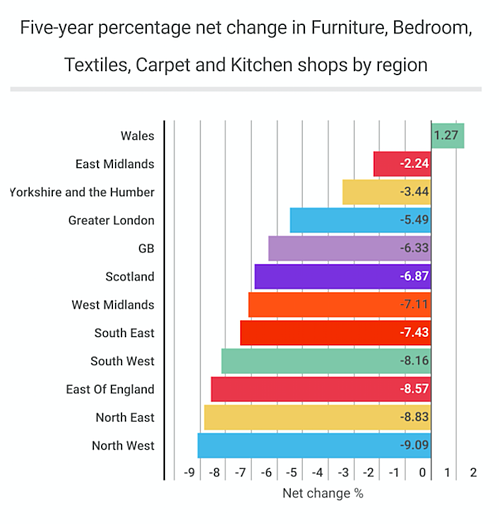 Carpetright’s closure of under-performing stores over the last five years has had the biggest impact in this category (net decline of 59 Carpetright stores in the last five years). Beds, Bedding and Blanket stores experienced a net decline of 81 stores (-11.3%), although the major players Benson For Beds and Dreams defied this and grew store numbers. Nursery Goods and Accessories saw a net loss of 83 stores (-32%). The closure of Mothercare and Mamas & Papas stores had the biggest impact on this decline in numbers. The main challenge these categories face is from online players and start-ups, which offer more flexible terms such as Eve Mattress's 100 day trials. The percentage of sales attributed to online in the Household goods category jumped from 5.9% in 2012 to 9.7% at the start of 2017 (+3.8%). This increase was faster than the non-food retail average (+3.4%). Internet sales in the Household goods stores sector grew at a faster rate than all of the other non-food categories, in two of the last three years (Source: ONS). 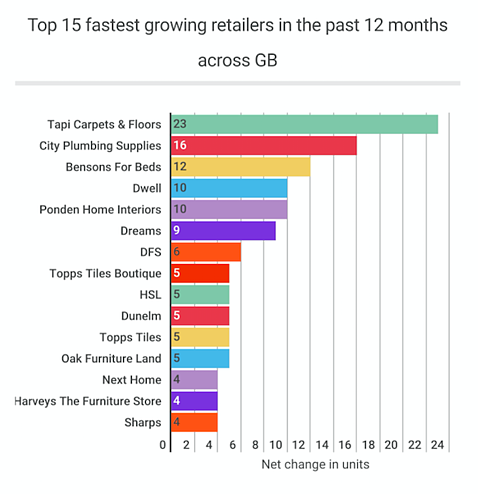 The fastest growing retailer in the last 12 months in the bulky goods sector is Tapi Carpets & Floors, who have expanded rapidly since their launch in 2015. Tapi has opened 23 stores in the last 12 months which equates to a huge 66% increase. 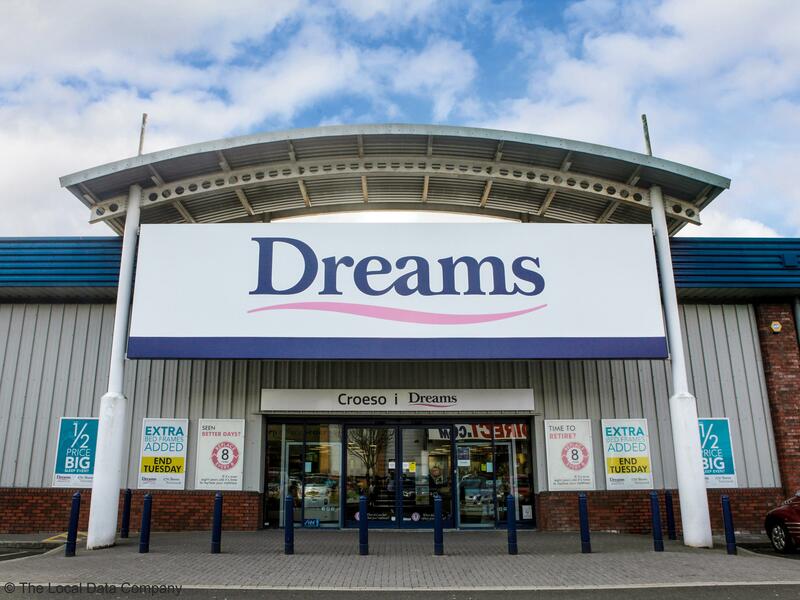 Another retailer who is growing is Dreams who has opened nine stores in the last 12 months and has further plans to open 20 of its new smaller store formats throughout 2017. Dwell, which was acquired by DFS in 2014 has opened several in-store concepts under DFS’s Customer Distribution Centre (CDC) conversion programme. This programme is aimed at releasing additional retail space by removing DFS’s warehouse operations from stores to off-site facilities. 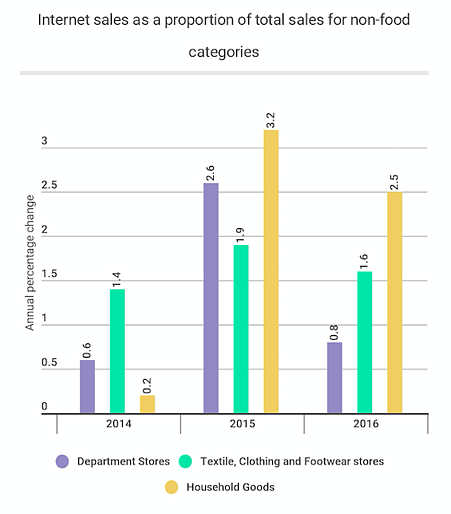 From numbers shown in Figure 6 above, growth has occurred in High Street locations, with retailers looking to increase their brand awareness in high footfall locations. 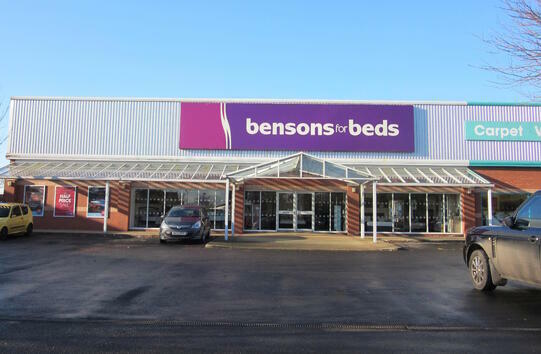 For example, Benson for Beds have nearly doubled their number of high street stores from 12 to 22 in the last 12 months. “The bulky goods sector has seen a number of challenges over the last decade. These being namely the increase of competition from store expansion and the more sophisticated online channel offered by the physical retailers, especially the pure online players such as AO.com and Amazon. Kiddicare was the first major challenger in this space who achieved online success which then moved to in-store success before being acquired by Morrisons where it disappeared. In addition to fierce competition, the traditional haunt of these retailers, the out of town retail park, has gone from being a low cost location option to one where rents have doubled and even tripled as the likes of Next, M&S, Poundland, TK Maxx and others have sought to open and thus have driven up competition for space as well as rising rents.